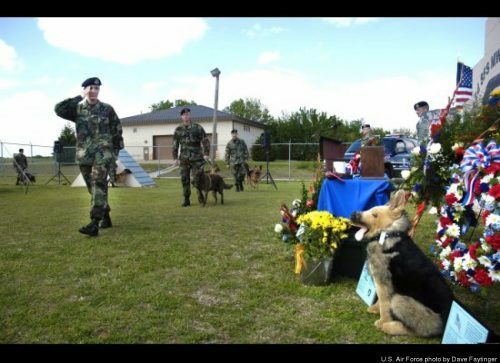 Remembering Military Working Dogs and their handlers. 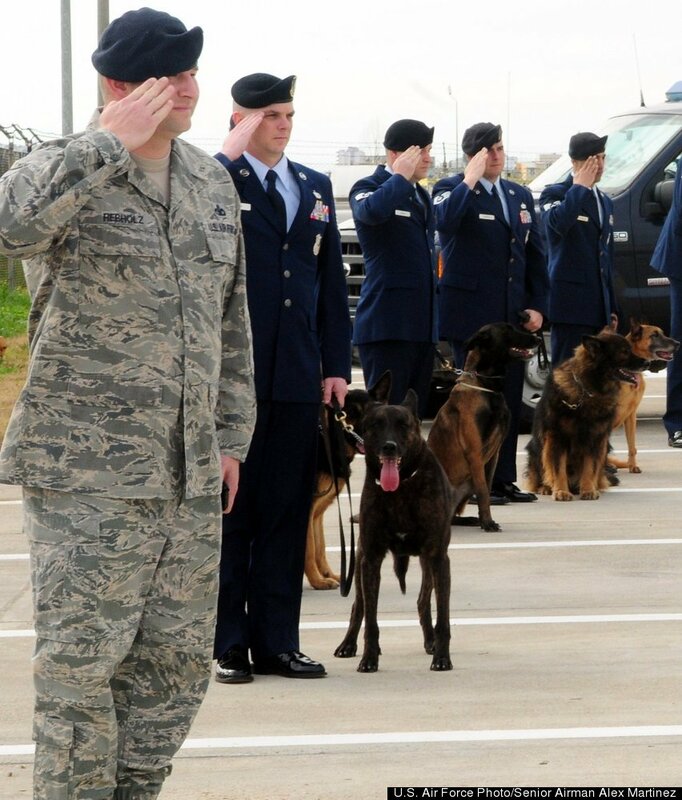 39th Security Forces Squadron military working dog handlers salute during the playing of the national anthem during a memorial service in honor of Ronnie, a fallen MWD, at Incirlik Air Base, Turkey. Staff Sgt. Alissa Jones salutes as she passes the memorial display for military working dog Marco during a recent memorial ceremony at Tinker Air Force Base, Oklahoma. Sergeant Jones and Marco were deployed to Iraq when the dog was electrocuted while patrolling for bomb-making materials and weapons in Baghdad. Following Sergeant Jones are: Staff Sgt. Brent Reimers with MWD Bratling; and Staff Sgt. Arthur Dennis with MWD Jambo. 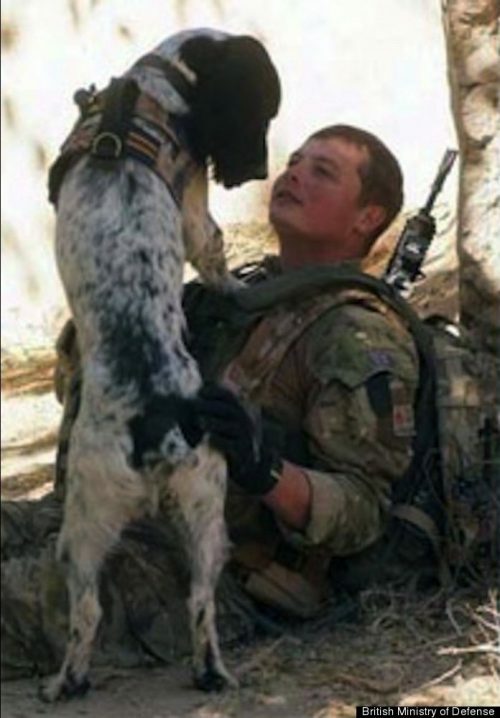 Lance Corporal Tasker of the British Army deployed to Afghanistan in September 2010 with his bomb-sniffing Springer spaniel named Theo. On March 1, 2011, Tasker and Theo were on patrol when they were caught in a firefight. Tasker was hit by a sniper and died on the scene; Theo was untouched. However, a few hours later after returning to camp, Theo collapsed and also died. Some believe the dog – only 22 months old – died of a broken heart. 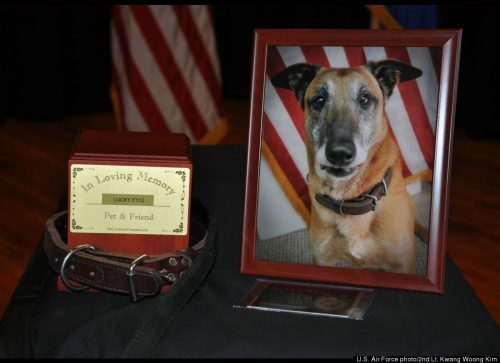 A display in honor of Lucky, a 92nd Security Forces Squadron military working dog, is present during the memorial service held at the Deel Community Center at Fairchild Air Force Base, Washington. Lucky died of cancer in September 2011 at the age of 10 after surviving five tours of duty in Iraq, Afghanistan and Kyrgyzstan. 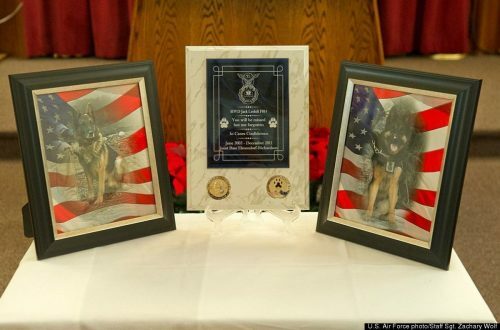 Photos and a plaque mark the memory of two military working dogs during a ceremony held at Joint Base Elmendorf-Richardson. While assigned to the installation, the dogs tallied up a combined more than 1,000 hours in search time and over 400 hours of foot patrol. 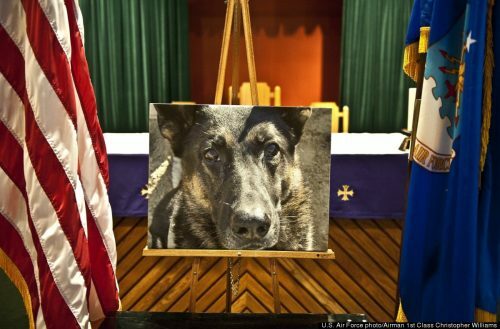 A photo of Rony, a deceased military working dog from the 1st Special Operations Security Forces Squadron, is on display during a memorial ceremony. Rony, who served for more than seven-and-a-half years, was suffering from cancer and was euthanized in March 2012.